Eddie Hearn is “not in the slightest” bit worried about Warrington-Frampton. The Matchroom boss revealed earlier this week that he plans to put on a big pay-per-view rematch between feuding heavyweights Dillian Whyte and Dereck Chisora at the O2 Arena in London on DECEMBER 22nd. The fight date clashes with that of the seemingly agreed but unannounced and unconfirmed Josh Warrington v Carl Frampton IBF featherweight world title fight at the Manchester Arena. While many fight fans have lamented the prospect of having to choose between the two, Hearn does not view the clash as real competition and believes that Whyte-Chisora 2 could outsell Warrington-Frampton TWENTY times. The English promoter sees big differences between the two fights and believes that, commercially, everything is stacked in Whyte v Chisora’s favour. The pair box in the lucrative heavyweight division, have fought each other before in an extremely entertaining fight, share a heated ‘beef’ that entices the more casual fan, and have the full force of the Sky Sports machine between them from SSN to Soccer AM to A League of Their Own. The Essex fight boss has previously promoted a pay-per-view involving Frampton – the Belfast boxer’s super bantamweight unification versus Matchroom’s Scott Quigg in Manchester in 2016 – and memories of this, along with other observations, has him believing that the BT Sport pay-per-view will be blown out of the water. “Frampton-Warrington, brilliant fight, but it’s not going to break 100,000 buys, it might struggle to do 50,000. While he claims that December 22nd was his only option due to venue restrictions, Hearn claims this particular clash is not a major issue for his outfit and he predicts that few people will choose Warrington-Frampton over Whyte-Chisora 2. It is four weeks tomorrow since Frampton defeated Luke Jackson at Windsor Park but his title challenge of Warrington remains unannounced – although common promoter Warren has claimed “it is on” that night in Belfast and has since assured that the fight will take place before the end of the year. 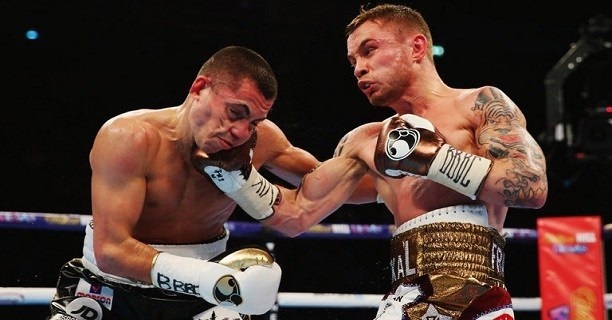 The December 22nd date which was widely reported last weekend – and which had made logical sense – has yet to be even commented on publically by Frampton, Warrington. A press conference for the fight was mooted for this week or next but details remain forthcoming.